Electives in paediatrics for 5th year students. Schedule. Classes are held once a week for 10 weeks since 28-02-2019 to 16-05-2019 for the whole group. They are held in the lecture room of the Department of Paediatrics, Haematology and Oncology (the builting at Jurasza street, 6th floor). Duration of classes is 135 minutes, plus 15 min. break. Classes usually start at 17:15. The time cannot collide with any other classes. The date and time may be changed (but the change must be agreed with students and the lecturer). Please, let the secretary of the department know about each change. According to the rules of studies, the classes are compulsory. Since the classes cannot be redone (the subject changes every week), we allow to leave one class. Click "read more" for more info & schedule. 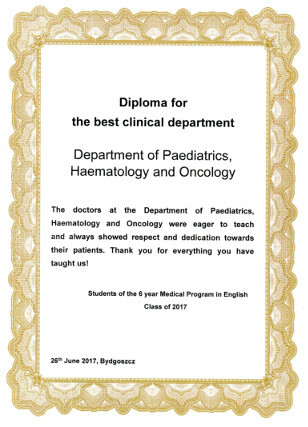 It's our great honour to anounce our Department was awarded by English Division students of 6th year as the best clinical department. It is a great pleasure to know that our efforts to hepl young people achieve professional knowledge and skill was appreciated. Read more about Our Department awarded! This year classes in paediatrics for 5th year students are held at the Department of Paediatrics, Haematology and Oncology (Antoni Jurasz University Hospital in Bydgoszcz), at the Department of Paediatrics, Endocrinology, Diabetology and Neurology in Toruń and at the Department of Paediatrics, Allergology and Cardiology in Toruń. 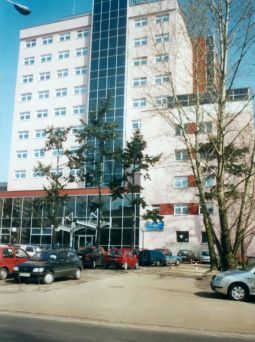 Both departments in Toruń are located at Wojewódzki Szpital Zespolony, ul. Konstytucji 3 Maja 42. English Division students can now download presentations selecting "Doc for download" menu. These are all presentations that were released by the lecturers. To download the file you have to accept terms of usage and, in most cases, enter the password. The idea was to limit access to our files for the whole community browsing the internet. You can get the password in prof. Wysocki's office.